1 Bedroom Suite at Tahiti Village in Las Vegas, Nevada! Tahiti Village in Las Vegas, Nevada - Buy a 7 Night Stay in a 1 Bedroom Moorea Suite! Enjoy 7 Nights at Tahiti Village in Las Vegas, Nevada! Tahiti Village is a newly constructed 5-Star resort conveniently situated on the world renowned Las Vegas strip. The Polynesian themed resort provides the relaxing environment of a tropical island, filled with lush landscaping, lagoon styled pools, and subtle touches of Polynesian culture. Almost every convenience imaginable is available at this resort. When you come to Las Vegas to get away, this is the place to stay. 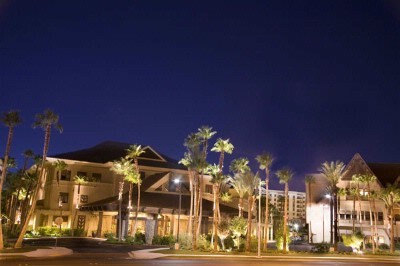 Tahiti Village is located on the famous Las Vegas Strip, just south of McCarran International Airport. The heart of this Polynesian-themed resort is a beautiful main pool area, complete with a lagoon-style pool with sand-beach entry, a lazy river, a cascading waterfall, wet decks for lounging, hot tub, and palapa umbrellas. Amenities include two fully equipped fitness centers, sauna and spa, activity center, concierge, convenience store/gift shop, Tahiti Joe's restaurant and the Tiki lounge with limited gaming. 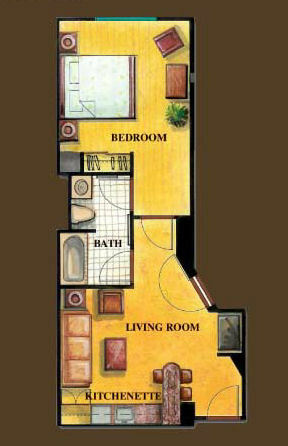 Your 1 Bedroom "Moorea" Suite has a limited kitchen and sleeps up to 4. These luxurious 580 sq. ft. suites sleep four guests and are tastefully decorated with all the comforts of home in mind. They feature one king bed in the private bedroom, a sleeper sofa in the living room, and a fully equipped kitchenette with granite countertops, mini fridge, microwave, and coffee maker. Complimentary WiFi is available in all guest rooms and public areas. Complimentary WiFi is also available at our Tahiti Joe's Restaurant.